If you’re a supervisor or a manager in a particular company, then you know just how important it is that you are able to assess the performance of every single one of your employees. By knowing how well they’re doing in terms of fulfilling their duties, you should be able to see their value to the company. 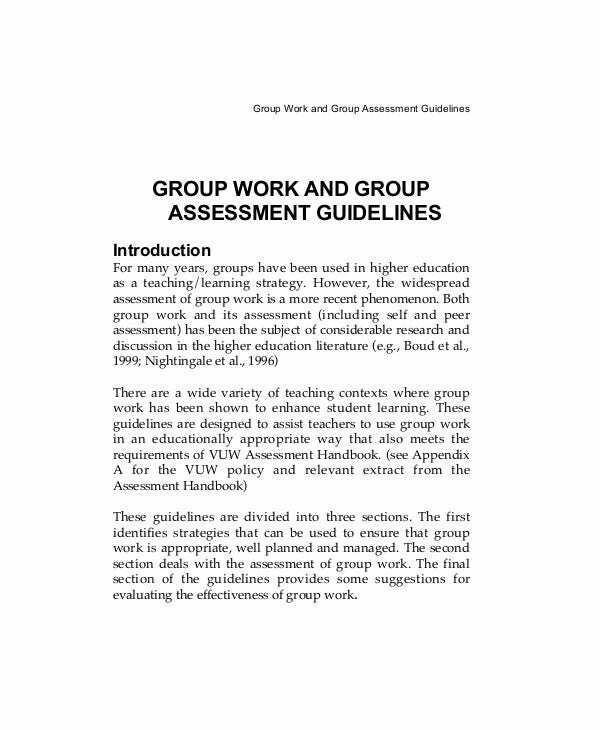 You may also see sample needs assessment templates. The more you know about your employees regarding their performance review, then that will allow you to make an important decision on what needs to be done in order for your employees to improve. And that’s why one needs to know how to conduct a business assessment and this article is going to teach you how to do just that. 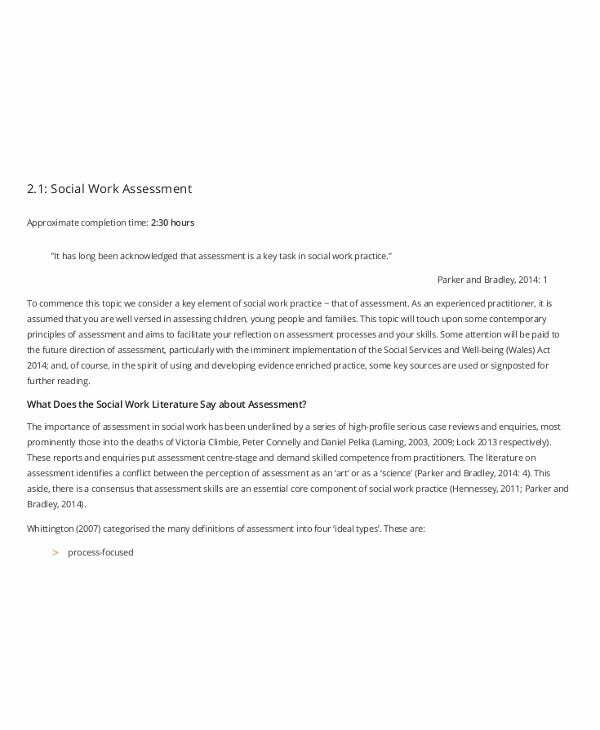 What Is a Work Assessment? A work assessment is done in order for one to understand the nature of currently existing problems within the employees and in the workplace. Basically, you’re trying to determine all of the different factors that can tell you if employees are doing their job well, or if there are certain reasons as to why they aren’t meeting with expectations. This means having to go through their basic job description, knowing if their fulfilling the tasks that they have been assigned with, and if they’re doing so in a manner that’s acceptable to the company. When it comes to the work being done in the office, you’ll need to take at all of the strengths, weaknesses, areas of opportunities, and threats that could potentially affect the employee in terms of how he/she goes about the job. So an assessment is one of the est ways in ensuring that an employee knows or is reminded about his/her objectives, as well as how he/she should go about in achieving them. Remember that the entire point of the work assessment is to help with improvement in a way that allows you to see and solve unseen problems that are directly affecting the employee’s performance. Remember that a work assessment isn’t just for checking on how employees are doing in terms of their job, it’s also for you to see the conditions of the workplace and what can be done to improve them. Even you should be able to see that one can gain a ton of benefits from doing such a simple assessment. So what are these benefits exactly? 1. You get to understand the different working styles of each and every one of your employees. You should know that all of your employees are not similar when it comes to how they go about in doing their jobs. If you’re the employee’s manager or direct supervisor, then you would want to do everything you can to make sure that your employees continuously improve throughout their entire tenure in the company. This means that you’ll need to assess all of the different factors that affect employee performance. Doing so will give you all the information you need to be able to find a method which will help ensure that you’re able to help the employee. This actually benefits both parties as one gain or improves the necessary skills in order to function well in the office, and the other can guarantee that a position’s task objectives are known and are met. 2. The reduction of formal complaints made by employees. If you’ve ever worked for a company, then even you should know that you’re bound to run into a few problems here and there, and some of these problems might be too big that they can no longer be ignored by employees. It’s not just problems in the workplace either, but they can also come from how the employees are performing or how their performance is being affected. Which is the reason why that companies usually have employee complaint forms that can be filled out by anybody that’s working for the business? 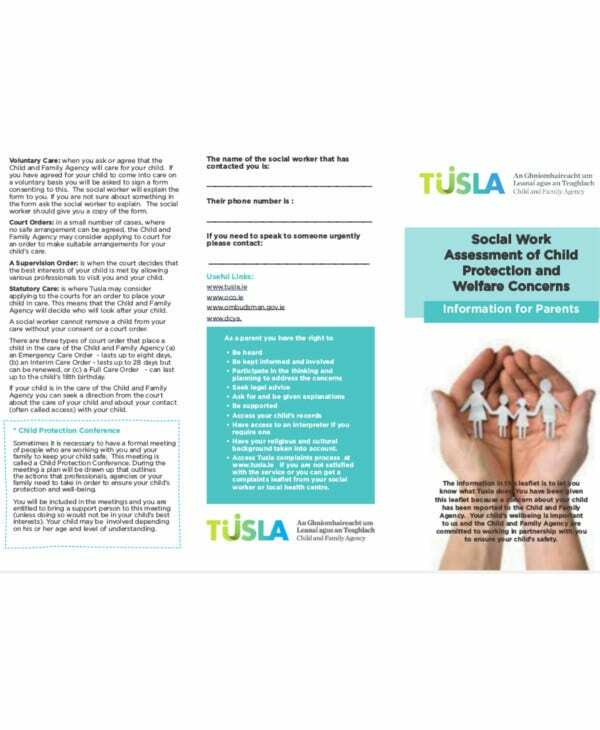 Once all of them have been collected, supervisors or managers will need to assess all of the information that has been gathered in order to know what these problems are. Doing so will allow them to understand what needs to be done in order to solve these problems, and to help determine which of these problems have to be prioritized. 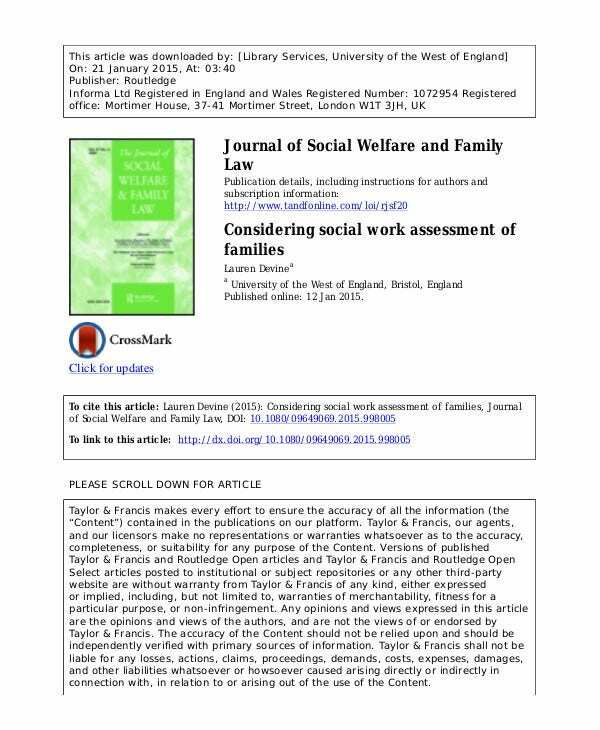 You may also see free needs assessment templates. 3. Fulfillment of legal requirements as well as the reduction of potential lawsuits against the company. No matter which organization you end up working in, you know that there are company policies that just about every single person within a company will need to follow. The reason why these policies are made? It’s so that everyone understands that there are certain laws and regulations that need to be upheld to prevent anything negative from happening to the business. If you’re the person that’s in charge of creating the company policies, then it’s your responsibility to know what laws you’ll need to follow and legal requirements you’ll need to fulfill while you’re thinking of making them. Not only that, but you’ll also have to make sure that every single employee within the company follows these policies to the point where you won’t have to worry about anyone breaking them. Also, you’ll need to remember that doing this guarantees that you won’t have to face lawsuits from either employees or even the company’s own customers. 4. Employees will know what it is they that they’re doing right. If you’re going to conduct a work assessment, you’ll want to point out all of the employee’s strengths or what he/she is exceeding at in terms of performance. Even something as simple as telling the employee that he/she is doing a good job is one of the best ways to improve their self-confidence and motivation. If your employees are happy, then there should be no doubt that they’ll continue to do a good job and provide the company with great, if not better, results with each job done. 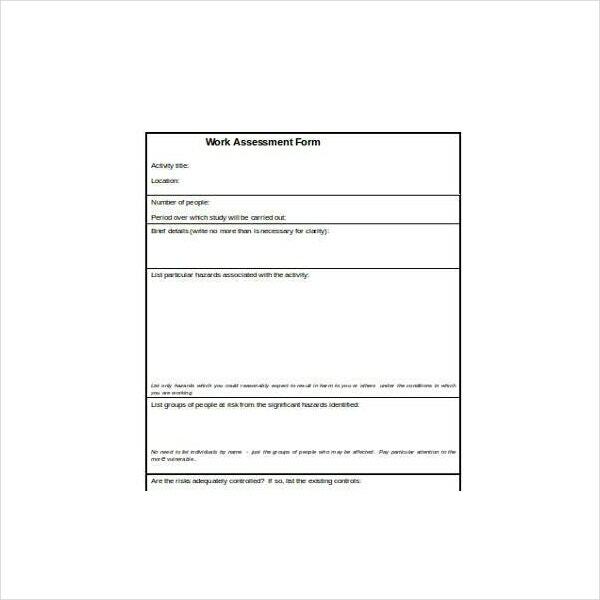 You may also see Nursing Assessment Template. 5. It allows you to figure out which of these employees should be rewarded. Throughout your work assessment, you will find a couple of employees that ma have been doing an exceedingly good job. And of course, if an employee knows that he/she has been doing what he/she has been assigned to do well, then that person would want a reward for all the effort. These rewards can come in the form of a salary raise, a promotion, or even both. Doing a proper assessment will allow you to figure out which of your employees deserve these rewards. Also, giving these employees rewards will help tell them that the company has seen their efforts and that reason could very well help them to continue with their excellent performance. So think of these rewards as an incentive to make these employees to want to do better things for the business. 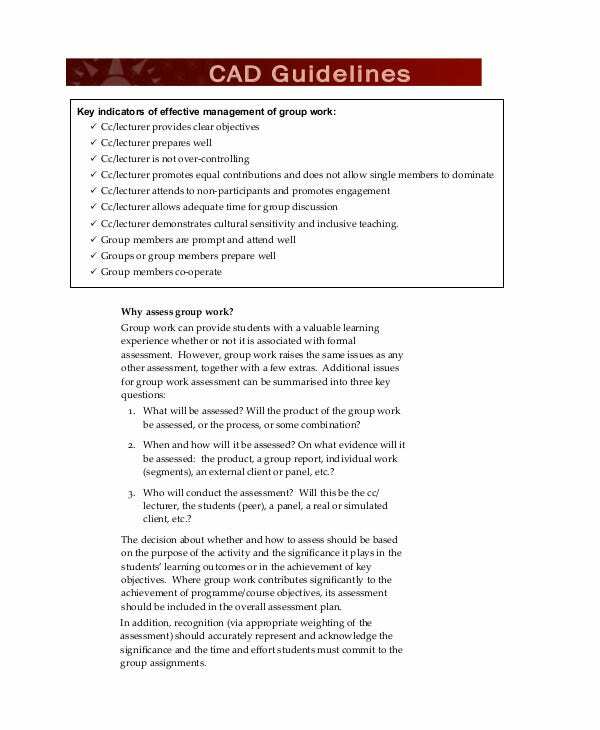 You may also see Project Assessment Template. 6. The work assessment will make employees believe that management is doing everything possible in order to determine all of the different problems in the workplace, as well as ensuring that the working conditions of the company are improved. Employees won’t want to work with a company that would ignore the problems in the workplace, which is exactly why these assessments need to be conducted so one can learn about these problems and fix them as soon as possible. The more an employee sees that management is willing to figure out and fix their problems, then the more trust that will be developed. 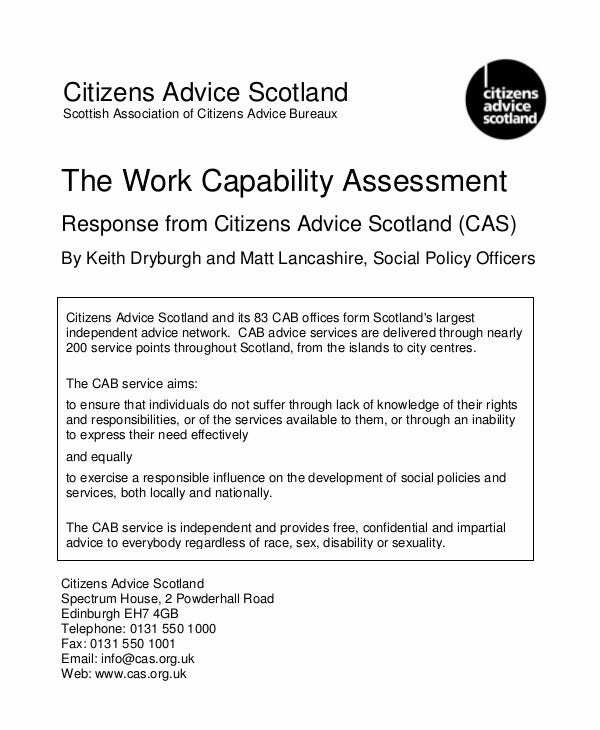 You may also see Impact Assessment Template. 7. This helps in the improvement of employee morale. One of the things that keeps an employee going in the workplace is the office morale. Remember how we talked about how important it is to keep employees happy? 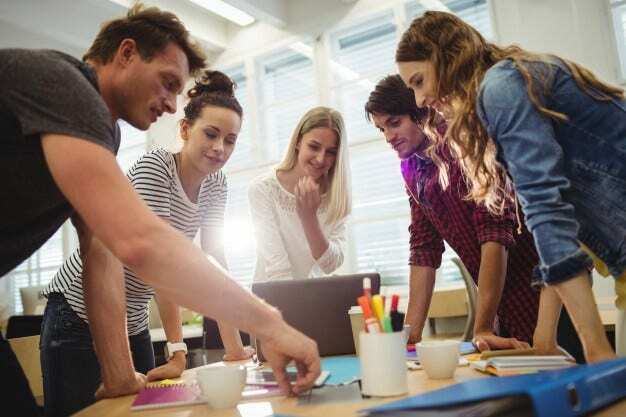 Well it’s important that you ensure that they always are so that all of your employees will do their best so that the company can reach its smart goals. One of the best ways of boosting employee morale is by committing to meaningful discussions with the employees, as well as conducting all of the necessary actions in order to solve issues within the workplace. 8. It lets the employees know that the company is willing to assess and fix all of the work-related illnesses, as well as workplace conflicts in a timely manner. If an employee were to spot several dangers in the office that aren’t even supposed to be there, then it should be pretty obvious that they would be reluctant to provide the company with the work that’s expected out of them. So a doing a timely assessment and figuring out what these problems as, as well as fixing them the moment that they’re spotted, is a good way of telling your employees that you care about their well-being. 9. It gives employees the opportunity to voice out any concerns that they have and it ensures that they’re heard by management. A thorough assessment can only be done if management actually gathers all the information they need regarding the workplace and the employees in them. Remember that one of the best ways to gather this information is through the use of complaint forms, but you should know that this isn’t the only way for you to gather what you need. You may also make use of survey forms which will allow your employee to voice out their concerns anonymously. Employee’s who won’t’ have to fear what they want to say tend to be more open when voicing out their concerns towards management. So think of the best ways that allow you to get the information you need and use them. You may also see security assessment templates. While it’s never an easy thing to conduct a work assessment, it’s still something that one has to do to guarantee that every single employee is able to perform in a way that they’re expected and to give them a good and comfortable working experience. So if you’re going to conduct an assessment, be sure to follow all of the steps above to help you. 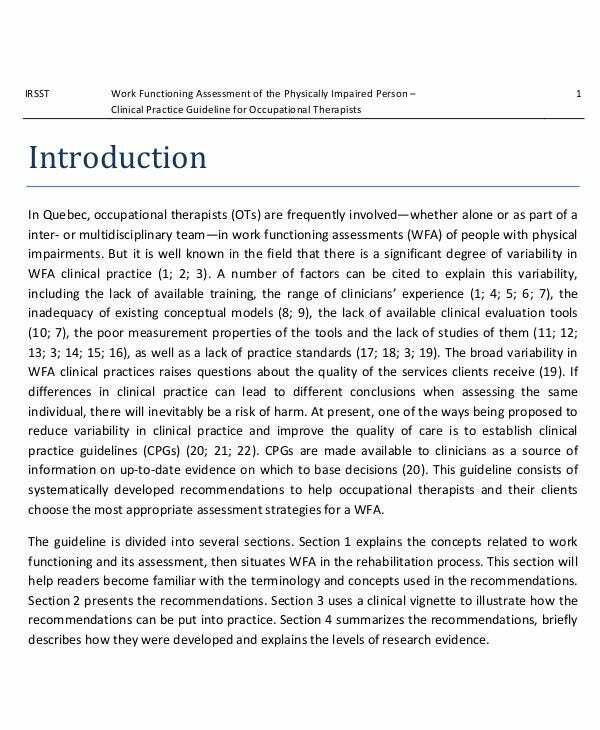 In the event that you would like to learn more in regards to how you should go about in doing a work-related assessment or anything similar to the topic, then all you have to do to is go through our site and find the articles you need. Once you have those articles? You can use all of the information in them to help you and your business out. You may also see Security Risk Assessment Templates.